"A man of aggressive and active leadership." 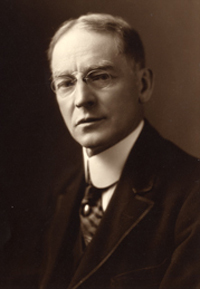 Born April 18, 1862, in Carrolton, Mo., William A. Shanklin, the first president born outside the Northeast, was educated at Hamilton College, spent 18 years in the Methodist pastorate, and then became president of Upper Iowa University before being elected president of Wesleyan. United States President William H. Taft offered remarks to more than one thousand guests assembled at the Middlesex Opera House for the Shanklin inaugural in early November 1909. Vice-President James S. Sherman and Senator Elihu Root also made remarks. The presence of the president, his vice president, as well as a U.S. Senator, created much excitement in Middletown. Shanklin was the only president in the first 100 years of Wesleyan who did not teach any classes. As a result of fundraising campaigns in 1910 and 1911, more than $1 million was raised to pay off the deficit, raise faculty salaries, and set aside a small surplus. A swimming pool was built in Fayerweather gym, Memorial Chapel was remodeled and an organ installed, and Van Vleck Observatory was constructed and equipped with one of the ten largest lenses in the U.S.
During his tenure the student body increased from less than 300 in 1909 to more than 500 in 1915. Faculty salaries increased, as did the size of the faculty (from 35 to 58). In 1911, the Carnegie Foundation for the Advancement of Teaching put Wesleyan on its list of approved colleges whose professors could receive retirement funds, thus making the profession more attractive. This organization later became known as TIAA-CREF. World War I interrupted campus life. Students attended a summer training camp, and in 1916 a campus ROTC was established. The faculty was supportive of the war effort. President Shanklin served in the YMCA in France with the American Expeditionary Forces from January to June 1918, and in October 1918 the entire undergraduate body, with the exception of a few who were exempted, was inducted into the armed forces. In the fall of 1919, with the wartime rise in prices, he launched a campaign to raise an additional $3 million for the endowment. In 1922, Shanklin developed heart trouble and left campus to rest. He resigned for health reasons in 1923 and died of a heart attack on Oct. 6, 1924. During his absence from campus, Dr. Stephen H. Olin of the class of 1866 and later Professor Leroy A. Howland, served as acting presidents.